Writing about this Amendment in the Southern California Interdisciplinary Law Journal [Vol. 8:577 1999], Jol. A. Silversmith attempts to discredit the assertion that the ratification process for this article of amendment to the Constitution for the United States -- which was first rediscovered in a book of State law for Maine  by David Dodge and Tom Dunn and made public knowledge again -- was lawfully completed. For many years Mr. Dodge has been convinced that this article was properly ratified and then unlawfully suppressed, and he has called it the "Original Thirteenth Amendment." By calling it "Constitutional Nonsense," Mr. Silversmith -- of Harvard and the London School of Economics -- vigorously disputes the research of Dodge and others, and focuses quite rightly on Virginia, and what happened there in the years following the issuance of the original Thirteenth (hereinafter referred to by his appellation, TONA). Mr. Dodge and others focus on the issue of whether or not lawyers, or more specifically, attorneys at the bar, hold titles of honour in modern society, which Jol. Silversmith says they do not have. This assertion can be successfully disputed, but as any person who has really studied this subject of the original Thirteenth Amendment -- also called 'the Phantom Amendment' -- its history is fraught with difficulties, mystery, missing documents and peculiar contradictions. Protections against espionage, influence-peddling, graft, bribery, and the meddling of foreign agents in the domestic affairs and elections of the federal government and the several united States are built into the seventy-seven words approved by Congress, yet these are rarely discussed by its critics. The States where it was ratified were as disparate as New Hampshire, Delaware, and Georgia could possibly be. None of the State legislatures which rejected this proposed article had their proceedings interrupted by federal troops, or their votes over-turned by rump parliaments backed by federal bayonets (as was the case with the so-called Fourteenth Amendment). There are sound and logical reasons to believe it was properly ratified, and there is a fifty-seven year period in American history where many State law books and privately published editions of the Constitution show it to be valid. And, while this period of time is now revered as "the Jacksonian era," it is no accident that modern historians either know nothing of this Amendment, or regard it as "fluff." "The sovereignty, the honor, and the best interests of America have been assailed," said George Poindexter, Delegate from the Mississippi Territory, "by Francis James Jackson, Minister Plenipotentiary of His Britannic Majesty". Speaking of the British ambassador on the floor of the House of Representatives on December 30th, 1809, the gentleman from Woodville used all the florid constructions of political speech-making then common, and quickly sharpened his attack, like any good westerner would do. The British ambassador was, "a Minister sent among us to excite the demon of discord and division; a legalized spy, prowling from Hampton to New York and through every city, town, and village, to designate the victims of corruption, and to subvert, if possible, the allegiance of the citizens from their Government, and thereby promote the views of the King, his master." Historians concur in Poindexter's assessment of the perfidious nature of the British government, and their penchant for mischief. "Politically speaking, Great Britain was one of the most corrupt oligarchies in Europe at the end of the eighteenth century." Writing in 1932, Frederick C. Dietz of the University of Illinois adds, "the practice of politics gave the control of the government to a small number of important families." "It was the assembly of the landowning aristocracy," said Dietz of the House of Lords, "who were still dominant in Parliament". Seats in the House of Commons were regularly purchased by men who simply bought the votes of the so-called "decayed boroughs." Dietz also notes in his landmark work, A Political And Social History of England, that "in some cases boroughs were owned outright by a peer, and he had the absolute right to name their members in the House. The Duke of Norfolk controlled eleven seats ... Sir James Lowther, nine seats -- Lowther's ninepins; Lord Darlington, [controlled] seven." These facts were well-known to those American men seated in the Eleventh Congress, and especially to those Senators selected by freely-elected State Legislatures. The American experiment was truly a functional, revolutionary body by comparison, with democratic process inside of a Republic. Poindexter, the Virginia-born lawyer, was fully cognizant of what almost all the men of the western frontier knew at that time: British policy -- under the leadership of Sir James Craig, Governor-in-Chief of Canada -- was to encourage the Indian tribes and clans from southern Ontario to western Florida to resist both American diplomacy and expansion. To accomplish his goals Craig recruited the Shawnee leader Tecumseh, who was the son of a Creek woman and thus respected in their Upper and Lower Towns. "The British Ministry," said Poindexter, who was openly disdainful of New England's Federalists in the House, "on every occasion which required extraordinary duplicity, have availed themselves of this incendiary [Francis J. Jackson]." British hypocrisy in their own relations with the Indians was insignificant, compared to the threat that civilized, intelligent Creek leaders like William Weatherford -- also known as Red Eagle,  the nephew of McGillivray -- might quickly turn against their frontier American neighbors. When Poindexter's comments are coupled with an equally critical, and lengthy, speech given by Senator William Branch Giles of Virginia on December 8th, 1809, there can be no doubt that the growing antagonism against Britain, and its new ally, Spain, had reached a slow boil in the Congress of the new United States. There can also be no doubt that the long-standing animosity towards the British and the Spanish, in this era, was most pronounced among the southerners and Jeffersonians on the frontier. There men lived by their wits, by words and by their honor, and all wealth was based on two important variables: who owned the lands and who had the right to navigate the rivers. "The war between Great Britain and France that began in May, 1803 was the product of an antagonism between neighbors which had endured through many years of European political history." Maurice Ashley, in his History of Europe, 1648-1815, notes that the British considered Napoleon Bonaparte "an upstart and greedy tyrant. Napoleon, for his part, thought that Great Britain was ruled by a selfish and drunken aristocracy which maltreated soldiers and exploited the proletariat. He once declared that had he conquered Great Britain, he would have overthrown the aristocracy and established an egalitarian system." New England Federalists had their own set of antagonisms: the descendants of Puritans distrusted all things Jeffersonian, French and democratic; given the copious number of sailing masters who called Boston or New London their homes, Bonaparte's animosity toward their British cousins had to be well-known. It is not surprising, then, that these hard-headed Protestants also focused on Napoleon Bonaparte's family and his tendency to foment revolution, and then to replace weakly-drawn republican governors with aristocratic titles for his kinfolk, whose regimes were enforced by his imperial French armies. One of Bonaparte's most successful creations was the Legion of Honour, which provided rewards and ranks both civil and military, in 1802. "The Titles of Nobility Amendment does not have an illustrious history. The reasons for its proposal are obscure:" writes Jol. Silversmith "what we know of them suggests partisan politics or xenophobia, neither an admirable nor worthy motive for amending the Constitution." The sailing ships of this new country, the United States, ranged far and wide, which was why both French and British political leaders sought to control their ports of entry. War with France was narrowly averted in 1798. Partisanship among American politicians dissolved at water's edge: all agreed that the British practice of stopping ships at sea, and taking, or "impressing" those sailors they considered to be English was an outrage, a rank insult to the American flag and government. Xenophobia is a malady often suffered by mature societies, or aging autocracies like those which dominated both China and Ottoman Turkey at the turn of the 20th Century. For it to prosper as a social philosophy requires the decline of optimism and economic growth, although every known society is subject to flare-ups of intolerance or animosity towards the "stranger," or barbarians. To compare the frontiersmen of Kentucky and Tennessee with the corrupt Sultanate of the Ottomans is ridiculous, and insulting to the memory of so many great Americans. In North Carolina there were some counties where slavery was not permitted, and even in Louisiana there were free men of color, as well as many Haitian refugees: Fort McHenry in Baltimore was built by French engineers, while German immigration from the principalities bordering Denmark and Poland was welcomed, as were the Swedes. Aggressively committed to foreign commerce and fishing, the Federalists of Boston and Providence were building ships; meanwhile the new, democratic "nabobs" of the western frontier were setting up shops and manufacturing at Pittsburgh, Louisville, Natchez and Cincinnati. Thousands of planters and farmers, especially in the Mississippi Territory, looked to sell their commodities at New Orleans. Both the flatboat shippers and the Yankee sea captains had been injured by the Spanish decision to close the port of New Orleans in 1802. The Spanish were despised, but it was the British, meddling among the Indians, who provoked the most resentment among the frontier "nabobs" like Andrew Jackson and George Poindexter. In a letter to Caesar A. Rodney, from February 10, 1810, Thomas Jefferson noted "the hurricane which is now blasting the world, physical and moral, has prostrated all the mounds of reason as well as right. It is a blessing, however, that our people are reasonable; that they are kept so well informed of the state of things as to judge for themselves ... the true sources of their difficulties, and to maintain their confidence undiminished in the wisdom and integrity of their functionaries [Congress]." Therefore, both of the principal factions in the Senate had excellent reasons to seek a constitutional solution to the threats that the powerful, rich, and quarrelsome European monarchies now posed to their young Republic. Indeed, the leaders in the Senate were seeking to protect their young creation - not by passing federal laws which might not be firmly grounded in the Constitution, but by solving the problem confronting them democratically! To craft a constitutional amendment, at a time when the State legislatures were clearly in constant communication with each other on any and all such subjects, was the preferred method. In other words, the leaders were being true to "republican principles" as elucidated by George Washington, by submitting their remedies to an election, i.e., ratification votes, of their sovereign legislatures. By creating severe penalties for espionage, and by clearly marking "titles of honour" (or honor, with this additional prohibition), as an insertion to the Constitution -- these American titans were seeking protection from those political hurricanes stirring in the world at large. Nothing is hidden at all. The motive was not racist or exclusionary, nor was it a measure specifically designed to end slavery in those states where it was then legal. That is why both the free State of Ohio and the slave-holding State of Georgia witnessed unanimous votes of their legislatures, which resulted in their approvals. Joseph Bonaparte was made King of Naples in 1806 and Jerome Bonaparte -- well-known to Americans in Maryland -- became the King of Westphalia in 1807. Louis Bonaparte was installed as the King of Holland, which he governed poorly, from 1806 to 1810. Never one to stand on protocol, his brother forced him to abdicate and Holland was folded into France. Napoleon had taken similar liberties with Spanish territory, including Louisiana, which had been previously ceded to Spain on November 3, 1762. Reclaiming those lands in 1800, the French had agreed not to sell or alienate the territory under the Treaty of Ildefonso. A British plot to assassinate Napoleon Bonaparte, and to install a sympathetic royalist in Paris, led directly to the outbreak of war in 1803: needing money, Bonaparte ignored the Treaty and sold Louisiana to the United States. By the beginning of 1810 Sir Arthur Wellesley, now Lord Wellington, was igniting Spanish resistance and winning in the field against Bonaparte's armies. Federalists led by Josiah Quincy had vigorously opposed Jefferson's purchase of the Louisiana Territory, fearing that it would eventually add unrepentant French libertines and slave-owners to the union. But the deepwater sailors in the shipping business -- carrying furs, the new manufactured goods and cotton from New Orleans to Europe, with both passengers and sugar bound for New England itself -- soon dissolved those objections. Although the western frontier was distant from the eastern States, to travel from New Orleans to Washington, Baltimore, or Boston by sea was relatively very easy. The vigorous and robust frontier leaders of 1810 -- like Andrew Jackson of Tennessee -- were easily some of the most brilliant and peculiar men in history. And they were Jeffersonian democrats, even if they did not countenance voting rights for women or free black men. Their lives were completely intertwined with the land, and with the mysteries of the frontier itself. Quick-tempered and volatile, most of these "nabobs" knew more about the scalping knife than drawing-room manners. The new post roads enabled letters and newspapers to move quickly around the country. So, as Jefferson noted, the argument cannot be made that the leaders in the seventeen States did not know much about what was going on in Washington, or that they were out of touch with the philosophy and political views of the democratic Virginians. When Tecumseh and his brother, known as the Prophet, began agitating for an Indian confederacy in 1809, and when they confronted the unscrupulous William Henry Harrison in 1810, demanding the return of purloined lands, westerners needed little coaching to detect the insidious influence of the British governor in Canada. The United States could have secured an alliance with Tecumseh, simply by respecting the Treaty of Greenville and forcing Harrison to cede the land he had purchased illegally. But Harrison's intransigence pushed Tecumseh completely into the British camp, which in the autumn of 1811 was led by Sir George Prevost, in charge of Canada. The alliance was a cold-hearted calculation for the English, nothing more. "The parliament is, by corruption, the mere instrument of the will of the administration. The real power ... in the government is in the great aristocratical families of the nation." Jefferson continues, railing against the policies of the British in his letter of March 5, 1810: "their government is yet the most unprincipled at this day known." "The question whether a measure is moral, is never asked;" said Jefferson in his letter to Governor Langdon March 5, 1810. He concludes that the only question for the British, whether it was their Indian policy or their maritime laws, was "whether it will nourish the avarice of their merchants, or the piratical spirit of their navy, or produce any other effect which may strengthen them [the aristocrats] in their places." So, too, the partisan political disputes which set northern Federalists against southern Democratic-Republicans are not reflected in the overwhelming vote for the Titles of Nobility Amendment, in both houses. However, a major contradiction to Mr. Silversmith occurs on the vote taken in the Senate: he asserts that the vote in the Senate was taken on April 27th, 1810, and was registered as 19-5. But, using the federal repository library known as Seeley-Mudd, at Yale University, and their copy of The Debates And Proceedings in the Congress of the United States with an Appendix ... published by Gales and Seaton, Washington, in 1853, a different result is apprehended. Moving over to the House of Representatives, that body was wrapping up the business of the Second Session of the Eleventh Congress. On May 1st, 1810, a constitutional amendment proposed by Nathaniel Macon -- to limit members of Congress from taking appointments in the executive branch before the end of their elected terms -- was tabled (and thus, killed). With considerable support both from Federalists in New York and Massachusetts, and Democratic-Republicans in the south, the TONA was approved by a vote of 87-3. Eighteen of the 21 members from Virginia voted for it. Seventeen of the 18 members from Pennsylvania voted for it, while those from New York numbered 7 for it, 6 absent or not voting, and 1 against. Rhode Island's Richard Jackson, Jr. was absent, but the Revolutionary War veteran Elisha R. Potter, voted for it, and his life history is also crucial to a clear understanding the lawfulness of the TONA. Concern over the political machinations of the Bonaparte family -- Jerome Bonaparte having been married to an American named Elizabeth Patterson for three years -- surely influenced the judgement of Congress. The amended version reported to the Senate on February 15th of 1810, includes the phrase "title of distinction," but this TONA was too cumbersome in construction even for those flowery times. However, the idea that the Senate would draft a frivolous amendment just to punish a social butterfly from Baltimore, while right in the midst of an ever-deepening diplomatic crisis and with Spain falling into the arms of the British (after being conquered by France), is blatantly absurd. The survival of the Republic was in doubt. There is no doubt, however, that Marylanders were keenly interested in the subject, as their Legislature -- elected from the most Catholic of States -- ratified the amendment on Christmas Day of 1810. Mr. Silversmith notes that five additional ratifications were forthcoming by February 13th of 1811, and then he asserts (p.586) that "the legislative journals record that [Virginia] rejected the TONA on February 14th of 1811. This statement causes nothing but confusion, because, in his footnote to that assertion, Mr. Silversmith adds: "The House of Delegates previously had approved TONA on February 2, 1811." "It would have been impossible to clear up the uncertainty about many items printed from 1776 to 1820, if the original vouchers of the public printers had not been found. These vouchers were among the manuscripts which the compiler of this volume removed from the auditor's storage rooms in 1913." There is no entry for a report on a vote for or against the TONA, but there is an entry "on the petition from Accomac for a convention to revise and amend the constitution of the state", at pages 84-85. "I have received a letter from the Secretary of State [James Monroe] requesting to be advised whether the Legislature of Virginia had agreed to, or rejected, an amendment proposed to the Constitution of the United States, which had for its object the prevention of any citizen accepting any title of nobility, present, pension, or office, from any foreign prince or power." "Upon reference to the archives of this Department, no official document can be found which justifies a reply affirmatively or negatively. I submit to the Legislature the propriety of adopting some mode by which the difficulty maybe obviated." Page 138 of the Bibliography does record the order to print this letter (p. 145-146 of the Journal), and also notes that there is "no copy seen" of the Journal of the Senate for this same period, December 6, 1813 through February 16, 1814. Unfortunately for Mr. Silversmith and other critics of the lawfulness of this amendment, Governor Barbour's letter is completely disingenuous, and suggests only a bureaucratic embarrassment. James Barbour was elected to the House of Delegates in 1796. He was elected as Speaker of the House in 1809 and served until 1812, which includes the session ending on February 14th, 1811. If Virginia's House of Delegates approved the TONA on one day in February of that year, and then the Senate rejected it only twelve days later, why was Governor Barbour writing to the House and Senate at all? What is this letter, if not a legalistic fiction, a contrivance to cover up an administrative blunder, like not ordering the results of the vote to be printed as a public document? Since Barbour was later sent to the U.S. Senate by his Legislature, the idea that he was somehow mentally incompetent and forgetful is another absurdity. He served in the Senate until 1825 and was elected President pro tempore on February 15th, 1819, or just a few weeks before Virginia's legislators voted to issue their Revised Code. "Contemporary scholars understood that the amendment had not been ratified." This assertion by Jol. Silversmith falls flat on its face when compared to the great multitude of facts surrounding the Revised Code of Virginia, and his citations of works by Joseph Story, Esquire, (and others), only serves to raise numerous questions about the veracity of great men, great men of law, from this era. Authorized by an act of the Virginia Legislature (February 15, 1817), the complete revision of the State's laws were entrusted to five of Virginia's most prominent lawyers and legal scholars: William Brockenbrough, Benjamin Watkins Leigh, Robert White, and judges of the supreme court of appeals, Spencer Roane and John Coalter. On December 2nd, 1817, these gentlemen or "revisors" reported to the general assembly "on the subjects of those laws which, from their multiplicity, require to be reduced into single acts; as also, their report of such laws and parts of laws of a general concern, as shall remain in force at the close of the present session". When the work was concluded the legislators voted to issue the Revised Code with both the constitution of Virginia and the Constitution of the United States including the original Thirteenth Amendment intact and in its proper place. "The code of 1819 is as valuable to historical students as Hening's statutes. The footnotes are numerous and elaborate. On the subjects of many chapters the notes give an historical survey from 1619. There is a complete index of nearly 200 pages." In addition, Swem's notes in the Bibliography of Virginia explain that Benjamin Watkins Leigh was put in charge of the publication of the code, to be printed under bond by Thomas Ritchie, and that his assistants were W.W. Hening and William Munford, the most prominent legal scholars of that time (p. 170). Furthermore, at thirty years of age, Leigh had served in the House of Delegates during the session most in question by Mr. Silversmith -- 1811-1813 -- when the TONA was supposedly approved and then defeated, and was again elected to their House in 1830. Additionally, Leigh was a delegate to the constitutional convention for Virginia in 1829-1830. It must be recognized, as well, that Leigh was a skilled and accomplished political leader. He was sent to the U.S. Senate in 1834 and served for two years. He was certainly one of the leaders in the convention of 1830, and thus, one of the most trusted legal experts in the State of Virginia. Then there is the case of Burwell Bassett, who voted for the TONA as a Virginian member of the House in 1810, served one term in the House of Delegates (1819-1821), in between his terms of federal service, and was thus in a position to object to any irregularities in the Revised Code. His fellow Virginian, Philip Pendleton Barbour was elected as Speaker of the House for the Seventeenth Congress on December 4, 1821. This Barbour had been in the House of Delegates in 1812, while his brother was Governor, and it would have been very easy for Bassett to raise any questions concerning the legitimacy of the original Thirteenth Amendment, and its presence in the Revised Code. If Mr. Silversmith's assertion that the contemporary authorities did not consider the TONA to be ratified is correct, why were these men all silent on the issue, at the time? To be even more specific: the man who was Speaker when the supposed rejection vote occurred was then elected Governor, Senator, and President pro tempore of the Senate; his brother, who also served in the House of Delegates, was elected to Congress and served five terms, including one as Speaker of the House; then he was subsequently elected President of the State's Constitutional Convention, 1829-30. Representative Bassett, who voted for the TONA, served in the State House in the session following issuance of the Revised Code, and then returns to Congress for another three terms! These men did not protest its publication because they knew it was correct and properly, lawfully done -- and remember, these were men who would not brook any interference with the legitimate rights of their home State of Virginia, in any way. So, too, the previously mentioned Elisha R. Potter of Rhode Island left Washington after the 13th Congress: he again was elected to that State House, where he had served as Speaker in 1795 and '96. He served from 1816 through 1835 (with one break in 1818), and was thus present in that assembly in 1822, when they issued their State laws with the Constitution, including the original Thirteenth Amendment, attached. 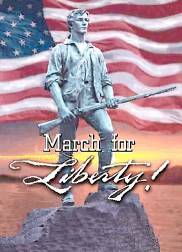 Potter -- a blacksmith who studied the law -- was a Revolutionary War soldier who gave more than forty years of service as an elected official. He was a political giant. For what reason would he have countenanced an irregular ratification? He voted against Madison and the War Hawks in 1812: and, it is simply impossible to believe that he did not know of the vote to reject the TONA, taken by Rhode Island in 1814. Mr. Silversmith asserts (p. 587), that Weldon N. Edwards, a Representative from North Carolina, made a request to President James Monroe concerning the ratifications of the original Thirteenth, and that the administration's reply indicates that Virginia did not ratify it -- at least not as of December of 1817. The Gales and Seaton covering the Fifteenth Congress does record his resolution (p. 530), addressed to the House: "Mr. Edwards stated that his motion was induced by some doubts whether the article referred to had been ratified by a sufficient number of the States to make it a part of the Constitution, although it appeared as such, he perceived, in the copies printed for the use of the members of the House; and it was desirable that a fact so important should be placed beyond question." The very next item of business for the House that day was an appropriation for federal officers in the new State of Mississippi, an issue raised by George Poindexter, the fiery "nabob" of 1809. There was continuity in that House, or what is now often termed "institutional memory." As a southerner, Representative Edwards could have asked, suggested, or demanded, that both Louisiana and Mississippi be instructed to consider ratification of the TONA. He did not. Neither does he appear as an opponent of the measure. In 1828 the North Carolina legislature approved a new edition of their laws including the original Thirteenth Amendment. Edwards was elected to the State Senate in 1833, and served eleven years; and, he was made a member of the State's constitutional convention of 1835. Edwards was returned to the State Senate in 1850 and then elected its President. In all of this public service, he had ample opportunity, and certainly a good position, to protest an irregular ratification! He was, in fact, the president of the State's secession convention held in 1861, which identifies him as an intensely political man. No such protests have yet been found. Finally, the legislature of Virginia authorized the distribution of the Revised Code of 1819. 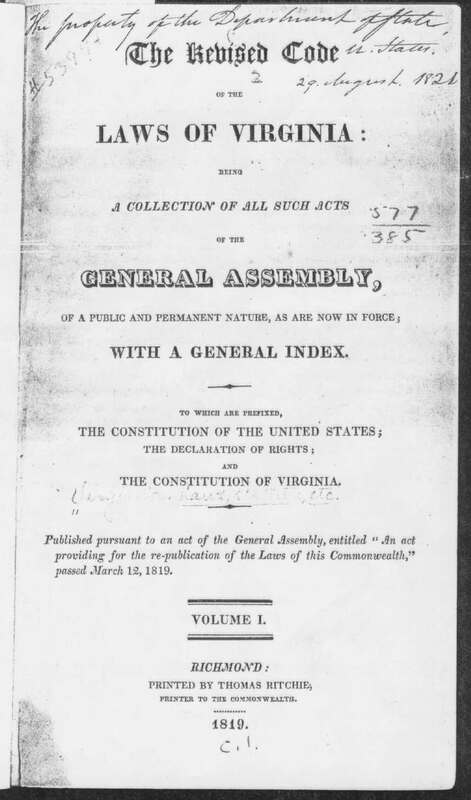 Again, the Revised Code contained the Constitution -- including the original Thirteenth Amendment as written in 1810 -- with ten copies designated for the executive branch of Virginia, five copies for the Clerk of the general assembly, and four copies for the Secretary of State of the United States; one copy each for Thomas Jefferson, James Madison, and President James Monroe; one copy each for the federal Senate, House, and Library of Congress, and one copy for every judge in the courts of the United States in Virginia. Thus was the Federal government notified of the ratification by Virginia. By February of 1820, sufficient copies of the Revised Code had been printed to make it available for public sale, and it was advertised as such in a Richmond newspaper. Research conducted on this subject indicates that at least six or seven other Virginia newspapers also carried advertisements for the new Code. Mr. Silversmith cannot explain the sanguine agreement on this article of Amendment between men who were political enemies -- anti-slavery Federalists from New England, and genteel southerners from Virginia. He cannot explain why the Legislatures of Mississippi and Louisiana (where the TONA appears in its State law books of 1825 and 1838), never expressed any outrage over being excluded from the ratification process. "Learning has been made unnecessarily aristocratic", wrote William S. Cardell, Esquire. "The means of instruction is the common right of every free citizen, and it is the excellence of our political system ...." Cardell was the Corresponding Secretary, in 1821, of the American Academy of Languages & Belles-Lettres, and an attorney in New York. "The humblest American should be taught to look on useful knowledge with respect," wrote Cardell, in the Academy's circular letter of July, 1821, "and not with jealousy .... Nothing can be more unfortunate for the United States, than for those citizens who hold the power of leading fashion to grow by degrees into a mock nobility, employing their wealth and influence to try to refine laziness and make vice attractive." "By the fundamental principles of our government, we can have no royal splendor nor hereditary nobility to support: no stars nor ribbons to bestow." And, "we can confer no durable possession of power." Titles of Nobility were prohibited in the body of the Constitution, as Jol. Silversmith notes in his argumentative style (p. 578). But "stars and ribbons to bestow" can only mean, and clearly refers to, knighthoods and special titles of military honour like the Legion of Honour, the Brothers of the Sword, and certain creations of the secret societies then popular inside of the British Army. "In associating true liberty with moral virtue, and both with intellectual excellence," wrote Cardell, concerning what to teach children, "it is a paternal obligation to give the impulse and light their way. After forty years of trial, our civil institutions are ... an incomplete experiment." Cardell's circular went out to the leading men of law in the union, and clearly their usage of the appellation Esquire in the terms of 1821, did not and could not conflict with these new prohibitions on titles of honour, which have "stars and ribbons to bestow." But what is truly troubling follows Cardell's slender pamphlet by just seven years: in 1828, Wells & Lilly of Boston publish the Public and General Statutes passed by Congress, 1789-1827, and as edited by Joseph Story. At least twenty-two separate publications of State law, with the original Thirteenth included, had been issued at public expense by the beginning of 1828. Story's home State of Massachusetts ratified the Amendment on February 27, 1812, and then published it as being valid in 1823. 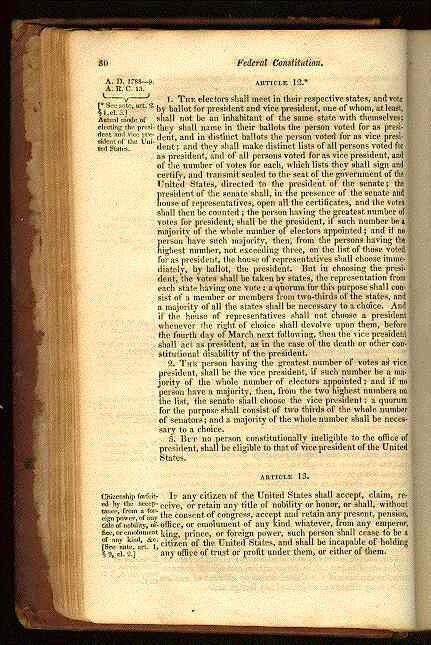 Connecticut, which rejected the measure in 1813, had issued two separate editions of their laws with the original Thirteenth Amendment included. Furthermore, a popular "reading book," used in the finest academies of that day, and edited by Samuel Williams, L.L.D. -- The History of the American Revolution -- was first published in New Haven in 1824 and went through thirteen editions in seven years and this text book concludes with the Constitution and its Amendments numbered I through XIII. Yet Story's two volume set doesn't even mention the issuance of the proposal! Therefore, this is the beginning of the conspiracy to suppress the original Thirteenth. Those lawyers who were allied to the Bar of Philadelphia and the Bank of the United States, or who were otherwise opposed to Andrew Jackson and his democratic reforms, begin the process of just "ignoring" this troublesome article of Amendment. But the real work of destruction -- the demolition by neglect -- does not begin until after the great Federalists like Timothy Pitkin, Jr. of Connecticut, retire from the House of Representatives. Like Ezekiel Bacon, his fellow graduate of Yale College, Pitkin voted for the TONA in the Eleventh Congress. Like Elisha Potter, he served in his State House for many years after leaving Congress, and was present when that body approved new editions of the State's laws. Mr. Silversmith cannot explain why such staunch opponents of the democrats from the western frontier, who were present when the TONA was launched, never protested its many publications -- both by their home States and out west -- without having to admit that it was properly ratified. They did not protest what they believed to be correct. Pitkin died in 1847, at the age of 81. In that year, Lives of the Heroes of the American Revolution is registered in "the Clerk's Office of the District Court of Massachusetts", and published in 1848 by Phillips & Sampson. It contains the Constitution with the original Thirteenth intact. But down in Philadelphia, sponsored by the friends of James Buchanan -- who has advanced to Secretary of State -- William Hickey's new edition  of the Constitution (with the endorsements of Roger Taney and other judges), does not contain the article. And, like Story's 1828 publication, every detail concerning the first twelve amendments is provided, but the work of the Eleventh Congress is missing. The General Laws of the United States, with references, was compiled by James Dunlop of the Bar of Pennsylvania in 1856. Published at Philadelphia by J.B. Lippincott & Co., it bears an astonishing resemblance to Story's two volume set, with no Article XIII. In 1858, Kay & Brother Publishers issued An Analytical Digest of the Laws of the United States from the adoption of the Constitution to the end of the 34th Congress, 1789-1857. As edited by Frederick C. Brightly, Esquire, of the Philadelphia Bar, it contains the following legend on its front page: "Respectfully dedicated to James Buchanan, President. A jurist and a statesman." Again, there is no Article XIII included, nor any mention of its proposal by the Eleventh Congress. What is required to believe Silversmith and the other critics of this Amendment, which provides such lucid, clear-minded protections against foreign agents-provocateur, bribery and graft-- the awarding of pensions, lands and titles of honor -- and espionage? Fourth, a person must discount the value of years of service given in the House by George Poindexter, the frontier fire-brand, his status as an elected Governor, and the five years he represented Mississippi in the Senate -- when its legislature repeatedly issued its laws with the original Thirteenth Amendment included! He must be judged as being inferior in his knowledge of the Constitution and of the events then current, and judged by critics who are looking back at him with bias and bigotry of their own! These facts about Poindexter also point out the fatal error of those scholars who assert that Louisiana, Indiana, Mississippi and Illinois had "rights" to vote on or approve the TONA when they entered the union, following its issuance in 1810. Fifth, the frontier democrats and the Federalist Yankees were not susceptible to British corruption, or to the subsequent manipulations of Nicholas Biddle and the Bank of the United States: for example, former Congressman Nahum Mitchell was returned to the Massachusetts House in 1809 and 1812. He was thus familiar with that State's ratification of the TONA in February of 1812. He was a judge and then chief justice of the court of common pleas, 1819-1821, followed by six years as State Treasurer. He was in a perfect position to dispute the authenticity of the original Thirteenth Amendment at any point in his career. There is no record of a protest by this reknowned Federalist. "I have the honor to transmit herewith the Documents and Correspondence relating to an important mission in which I was employed by Sir James Craig, the late Governor General of the British Provinces in North America, in the winter of the year 1809." "The publication of these papers will demonstrate a fact not less valuable than the good already proposed: it will prove that no reliance ought to be placed on the professions of good faith of an administration which, by a series of disastrous events, has fallen into the hands of a Castlereagh, a Wellesley, of a Liverpool -- I should rather say into the hands of the stupid subalterns, to whom the pleasures and the indolence of those Ministers have consigned it." The author was John Henry, a British spy employed to assay public opinion in New England, where the Federalist Party held sway. Twelve complete letters from Henry to Sir James Craig were reprinted -- in an unsuccessful attempt to discredit him -- by the New England Palladium (a Federalist paper in Boston), on March 24, 1812. Despite their bold assertion that Henry was, in fact, working for the French, these letters caused Madison and his allies to push more aggressively towards a declaration of war. "To bring about a separation of the States, under distinct and independent governments, is an affair of more uncertainty;" writes Henry, in Letter IX, who reminds his British masters that the southerners are primarily agricultural: "and, however desirable, cannot be effected but by a series of acts and long continued policy, tending to irritate the Southern and conciliate the Northern people." "This, I am aware, is an object of much interest in Great Britain, as it would forever secure the integrity of his Majesty's possessions on this continent; and make the two governments, or whatever number the present confederacy might form into, as useful and as much subject to the influence of Great Britain as her colonies can be rendered." "But it is an object to be attained only by slow and circumspect progression ...." Henry, then explicitly addresses the possibility of an unpopular war, stating that this, "against the consent of the other [party], alone can produce the sudden separation of any section of this country from the common head." "His consistent opposition to all measures of the Jefferson and Madison administrations involved him in a movement for an independent New England confederacy," writes Raymond Walters, Jr. of Timothy Pickering,  "which culminated in the Hartford Convention [of 1814]." In what was probably one of the worst-kept secrets ever, these leaders -- including Congressman Pickering, "a die-hard Federalist" and a strict Puritan -- gathered at Hartford to discuss the disasters the War of 1812 had laid upon them, their towns, their businesses and their shipping. Had John Quincy Adams, James Asheton Bayard , Henry Clay and Albert Gallatin not secured a treaty of peace, a separate, Federalist confederacy in New England was an even-money proposition. Thus, even though he had died, the plans and policy of Sir James Craig very nearly bore fruit -- the rotten fruit of Indian revolts, sectional jealousy, disunion, and secession. Clearly, the British Demon of Discord was abroad in the land, operating with Spanish gold and the promises of "presents, pensions," and "titles of honour". The inflammatory rhetoric employed by George Poindexter and other "nabobs" of the frontier, in 1809, was neither extremist nor unwarranted. The Titles of Nobility Amendment was their brilliant counterattack. It was a republican net designed to sweep up royalist spies, purchased politicans and bribed citizens. And, it won support among many of those disaffected Federalists, because its language specifically prohibited Bonapartist pretenders from creating an imperial class in the body politic. 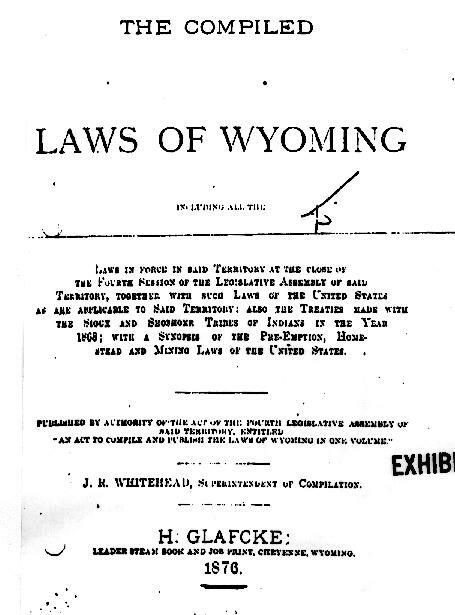 The large number of subsequent publications of the Thirteenth Amendment, in books of State law and in volumes of history, collections of Presidential addresses, and special publications of the Constitution -- for example, in the Whig Party Almanac of 1845, as issued by the New York Tribune - and the last that we find, the Laws of the Territory of Wyoming in 1876 similarly showing the Thirteenth Amendment, were not mistakes made by poorly informed frontiersmen. Too many of the men who supported this measure, in the Senate, were lawyers, to make the argument that it bans lawyers from being elected. Not under the terms and definitions current in that era, 1810-1820! The men who operated in government in the years after 1819 were not ignorant buffoons, and they were comfortable with what Virginia had done in publishing its Revised Code. A former judge, Governor Ninian Edwards of Illinois, was in office in 1826 when that State's Legislature approved a new edition of its laws to supersede the 1823 edition, with the original Thirteenth again contained in it. He was also the first Senator sent by Illinois to Washington 1818-1825, with extensive experience in the law and as the Governor of Illinois Territory 1809-1818. Such men were jealous of the rights of their States, and if Edwards had believed that Illinois was entitled to take a ratification vote, he would have demanded it. No such demand was ever made. Sectional jealousies would have been easily inflamed, in that time, if the principal scholars of the law thought that the original Thirteenth Amendment was installed by a Virginian cabal. Publishers based in the northern cities of Boston and New York apparently were unaffected by Joseph Story's 1828 volumes, because a wide variety of historical books were issued with the Constitution and the original Thirteenth included. Nor would the friends of Thomas Jefferson have remained silent, if they detected the judiciary assimilating new powers, in every session. "to consider the judges as the ultimate arbiters of all constitutional questions; [is] a very dangerous doctrine indeed, and one which would place us under the despotism of an oligarchy. Our judges are as honest as other men, and not more so. They have, with others, the same passions for party, for power, and the privilege of their corps." And, a quick study of the Nullification controversy can confirm this assertion: the leading men of the States in the 1830's were exceptionally vocal in defending the perquisites of their sovereign, constitutional republics. 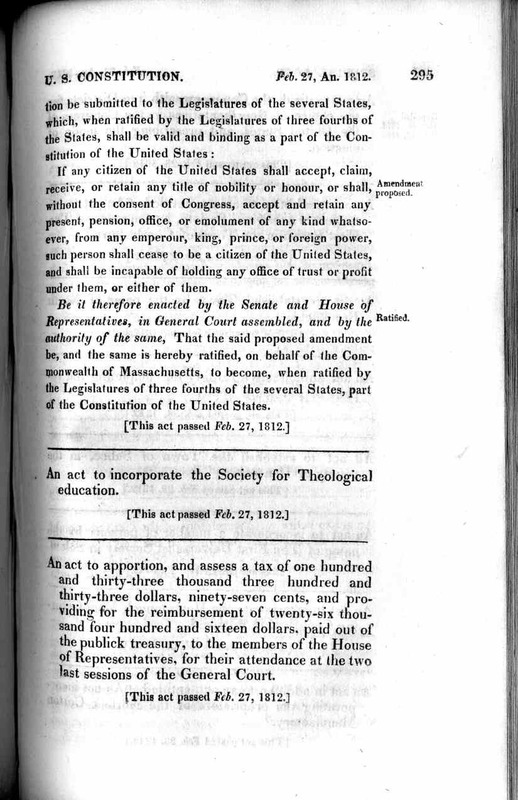 Oddly enough, the original Thirteenth Amendment clearly and unequivocally extends the authority of Congress over all manner of trading arrangements; and it clarifies the idea that Citizenship has its origin in a person's State of residence, with a federal 'octave' or level of responsibility in the world at large, which is subject to legislative oversight. Nor did the British or the Spanish give up their briberies and influence-peddling after losing the Bank to Andrew Jackson's veto. The whole checkered history of Texas and its failed annexations reeks of English meddling and espionage. James Buchanan and his various allies and cohorts, including Senators Judah P. Benjamin and Henry Clay emerge as the men who plotted the suppression of the TONA. Elected to the Louisiana State House as a Whig, Benjamin was allied to Senator John Slidell and his brother Tom, then the Chief Justice of the State. Admitted to practice before the Supreme Court of the United States in 1848, Benjamin certainly had motives for seeing the original Thirteenth Amendment suppressed. And the most famous case then current involved "the Cuban Filibusters," as those Americans who fomented revolutions in South American countries were popularly known. John A. Quitman, the Governor of Mississippi, "and a group of revolutionaries who sailed from New Orleans to Cuba [sought] to overthrow the Spanish government and annex [the island] to the United States." So writes Eli N. Evans, author of a laudatory biography of Judah P. Benjamin. When the raid on Cuba failed, crowds in New Orleans burnt the Spanish consulate to the ground and publicly trampled their flag. Quitman and his fellow revolutionaries were brought back to New Orleans and tried in a federal court. In the ensuing trials, all four of them, Quitman accused Judah P. Benjamin, the prosecuting assistant retained by the federal government, of accepting $25,000 in gold from Spain. Benjamin, of course, denied this and Evans shows that he was paid $5,000 by the United States for his work. Every trial ended in a hung jury. Revolutionary "Filibusters" wanted to increase the number of States and some were for slavery while others opposed it: but -- bringing Cuba into the union would directly threaten the slavery traffic by interfering with their system of Spanish agents, and by putting American laws over that island and its ports. John A. Quitman's Mississippi was a far more independent-minded place than modern American historians have cared to record. He was clearly and immediately dangerous to the Slidell-Benjamin-Buchanan pro-slavery cabal, a skilled political leader with Jacksonian tendencies and a fine military record. Buchanan did nothing to stop the country's slide into the madness of secession, and Civil War: it is easy to see, now, that the Demons of Discord may have purchased him outright when he was the American ambassador to Great Britain, if not years earlier when he was still in the Senate. The perpetuation of slavery meant one thing only for the British bankers and cotton factors of the 1850s, and that was the continuation of the cheap labor needed to clear new lands, and to cultivate and harvest the cotton. "The number of persons engaged in the slave-trade, and the amount of capital embarked in it, exceed our powers of calculation. The city of New York has been until of late the principal port of the world for this infamous commerce; although the cities of Portland and Boston are only second to her in that distinction. Slave dealers added largely to the wealth of our commercial metropolis; they contributed liberally to the treasuries of political organizations, and their bank accounts were depleted to carry elections in New Jersey, Pennsylvania, and Connecticut." -- From Volume One, No. 1 of The Continental Monthly for January, 1862: "The Slave Trade In New York." Histories of the post-Jacksonian era record that James Buchanan received the nomination for President from the Democratic Party, in 1856, chiefly at the behest of Louisiana's Senator John Slidell. An 1810 graduate of New York's Columbia College, Slidell, who was first admitted to the bar in New York City,  practiced law in New Orleans during the era when the TONA was published by the State. A staunch defender of slavery, another one of his proteges was Judah P. Benjamin, the young attorney sometimes called the Dark Prince of the Confederacy. "It requires no miraculous gift to be able to perceive why the [Buchanan] administration at Washington was sensitive as to the visitation of American vessels of doubtful character, by the officers of British cruisers," said the author. "The slave-dealing interest had demanded an immunity, that the piece of bunting known as the American flag should be allowed to protect from scrutiny every suspicious ship over which it should be raised. They had the power or influence to command, and the administration obeyed." "There was, some twenty years ago, among the upper classes in England a general desire to believe that the republican form of government was an impossible one," said Benjamin, then an attorney at the bar. "It was imagined that all the British colonies were future kingdoms for the children of the Queen, and I was constantly asked by letter and verbally by Englishmen not only of high position but more than average intellect whether it would not be better for the South to have a monarch than a president. I humored this idea or fancy and said on many occasions . . . that the best thing that could happen to the Southerners would be for Queen Victoria to make them a present of her second son and place her third son over Canada. This produced the effect in certain clubs as I had intended. The Duke of Argyll was strongly of the opinion that there would be monarchial governments all over American before the end of the century." Benjamin failed in his designs to get British ships and money for the slave-holding Confederacy, but Evans does record his other success: "Just before the Civil War, Salomon de Rothschild of the Parisian branch of the noted banking family met Benjamin, Hyams, and Moise in New Orleans." Thus were funds from the other great banking houses, the Rothschilds, mobilized on behalf of the stripling Confederacy by Benjamin, Dr. Edwin Warren Moise, Speaker of the Louisiana House, and Henry Hyams, then Lieutenant Governor of the State. As so many historians have discussed, the country was irrevocably changed by that war. It must now be apparent that the conflict itself was "the work product" of the Demon of Discord, and that British bankers, international royalists, and espionage agents  have never ceased to introduce distortions, nor to tamper with this great American experiment, a republican government of united States in Congress Assembled. "We dare not, we can not, we will not give up our country to disunion and severance." The meaning of this conflict over slavery and "free trade" in cotton was apparent to James B. Gilmore, editor of the new Continental Monthly. The Corwin Amendment stands as the Buchanan cabal's last and best effort to erase the original Thirteenth Amendment from American books of law. Devised by Thomas Corwin  of Ohio, and sometimes called The Seward Amendment, it was rammed through an anxious Congress after the failure of the Crittenden Compromise. 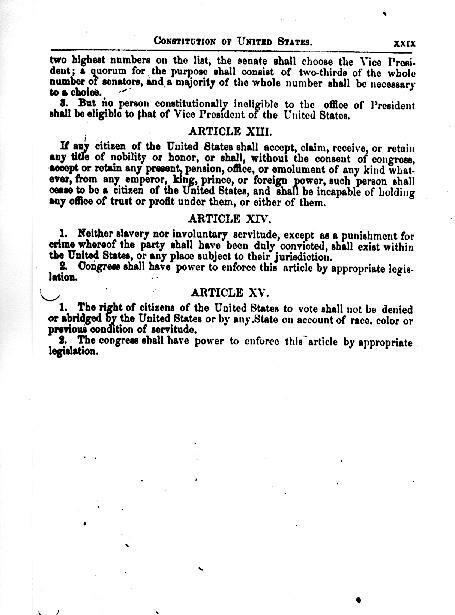 Endorsed by President Buchanan on January 8, 1861,  Senator John J. Crittenden of Kentucky proposed seven articles of amendment, designed to preserve slavery in those States where it existed, to prohibit it in certain Territories, and most odiously, to permanently disenfranchise every person of African origin. They would be barred forever from voting and public office. "Article Thirteen: No amendment shall be made to the Constitution which will authorize or give to Congress the power to abolish or interfere, within any State, with the domestic institutions thereof, including that of persons held to labor or service by the laws of said State." The Senate voted 39 to 5 to approve this section and it was sent to the House, where it passed 133-65 -- after a furious and rancorous debate -- on March 2, 1861. It appears at 12 Stat. 251, 36th Congress. Two State legislatures ratified it, beginning with Ohio on May 13, 1861, and followed by Maryland on January 10, 1862. Illinois bungled its ratification by holding a convention. It is the only Amendment ever issued by Congress with an article number in the text, and it would, thus, have permanently displaced the original Thirteenth or TONA. The original Thirteenth Amendment was the law, and even though it has been suppressed and forgotten, it remains our patrimony, our birthright. It is ours as a gift from the veterans of the Revolutionary struggle against tyranny, indolence and greed. 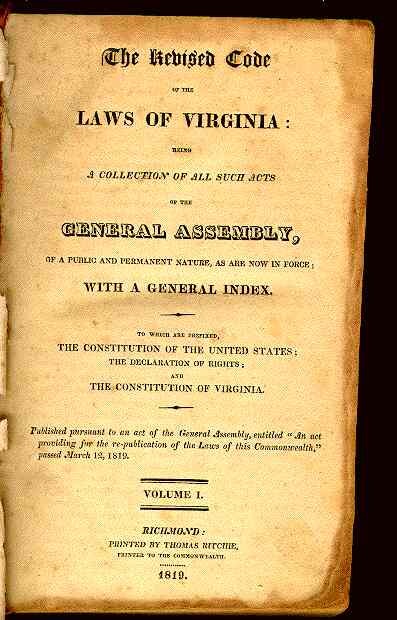 Although it was derailed by the War of 1812, the vote of the Virginia Legislature and its publication in the Revised Code of Virginia for 1819 stands as the lawful notice of ratification to the federal government. It belongs to us all, as Citizens. Dozens of opportunities to revisit it, or to protest it, passed unattended. That means the original Thirteenth Amendment was never revoked or deleted lawfully. "Everything that is hidden about the TONA is hidden in plain sight." The Debates And Proceedings in the Congress of the United States; with an Appendix, containing Important State Papers and Public Documents, and all the Laws of a Public Nature; with a copious index. Eleventh Congress -- First and Second Sessions. Comprising the period from May 22, 1809, to May 1, 1810 inclusive. Printed and Published by Gales and Seaton, Washington, . P. 530. That book has since disappeared from the library in Belfast, Maine: various bibliographies identify it as being either Laws of the State of Maine, two volumes, with appendix; prefix: Constitution of the United States and of said State; published according to a resolve of the State, March 8, 1821. Printer: J. Griffin. Or, Published Acts of the State of Maine, passed by the Legislature. Thayer, Tappan & Stickney, Printers to the State -- 1825. The index covers 1822-1825, inclusive. Old Hickory's War: Andrew Jackson and the Quest for Empire. David S. Heidler and Jeanne T. Heidler, Stackpole Books, Mechanicsburg, Pennsylvania, 17055. 1996. See Chapter One, "The Cream of Creek Country." The British at the Gates: The New Orleans Campaign in The War of 1812. Robin Reilly, G.P. Putnam's Sons, New York. 1974. P. 102. Old Hickory's War, p. 11. Ibid. P. 230. Ashley notes: "Another decision taken by Napoleon as First Consul, which met with criticism, was his institution of the Legion of Honour. This was a civil and military order, divided into ranks, chosen by a Grand Council presided over by Napoleon. The objection was that it was an inegalitarian measure which in effect created a new aristocracy." Jefferson's Letters: Arranged by Willson Whitman. E.M. Hale and Company, Eau Claire, Wisconsin. P. 260; also Thomas Jefferson - Writings, The Library of America, Library Classics of the United States, Inc. NY, NY. 1984 ISBN 0-940450-16-X, P. 1216. The British at the Gates: p. 172. Reilly comments: "Dated October 1, 1800, the Treaty of Ildefonso was accompanied by a clear stipulation that France would not sell or otherwise alienate the territory without first offering to return it to Spain. This was formally confirmed by the French ambassador in Madrid in a note date July 22, 1802, which was both official and explicit. Within ten months Napoleon had sold the territory to the United States for 60,000,000 francs ($15,000,000), a transaction partly underwritten by the banking house led by Alexander Baring in London." Jefferson's Letters: p. 262. also Thomas Jefferson - Writings, The Library of America, Library Classics of the United States, Inc. NY, NY. 1984 ISBN 0-940450-16-X, P. 1218. The letter is dated March 5, 1810 and contains a long and passionate denunciation of European royalty, and the British in specific. "The despot is the government", said Jefferson. "His power suppressing all opposition, maintains his ministers firm in their places." Jefferson and his protege, James Madison, were committed republicans, even though they were from the wealthiest class of Virginia planters, and slaveholders. To assert any different is a calumny. From the Biographical Directory, p. 550: James Barbour was born on June 10, 1775, at "Frascati" in Orange County, Virginia: he was educated in the common schools and read the law after serving as a deputy sheriff, and then was elected to the House of Delegates after one year as a lawyer; he served in the Senate from January of 1815 to 1825, when he resigned to become Secretary of War under John Quincy Adams. He was selected as the chairman of the Whig Party nominating convention in 1839, which nominated William Henry Harrison and John Tyler, Jr., who succeeded Harrison as President after his untimely death. The British At The Gates: Reilly notes a speech, in favor of the War of 1812, and given by Representative Peter B. Porter of New York: "War, he maintained, should be declared to assert and protect America's right to export its goods, unhindered and untaxed by any other country. It was not to be fought for the New England carrying trade or to defend the Northwest from Indians incited and supplied by the British." Randolph, who voted for the TONA, was surprisingly sympathetic to the Indians and bitterly hostile to the diplomacy of France. See "The Twelfth Congress," p. 51-52. The Circular Letter of the American Academy of Languages and Belles-Lettres is held at the Beinecke Rare Book Library on the campus of Yale University, and was dated July 12, 1821, in the City of New York. The author is William S. Cardell, Esq. The author examined an original edition of this book at the Yale Law School library in 1996: no explanation for Story's failure to even mention the joint resolution of 1810 has ever yet been discovered, and it is difficult to see how his livelihood as either a Justice or an overseer of Harvard College would ever be threatened by the anti-espionage provisions of this lawful Amendment. Ibid. (p. xviii). Senator John MacPherson Berrien was another leader who endorsed Hickey's truncated edition of the Constitution. A 1796 graduate of Princeton College, he served as a judge in Georgia's eastern circuit from 1810 to 1821, and was a member of the State Senate in 1822-1823. Three times elected to the U.S. Senate by the Legislature of Georgia, he was also appointed Attorney General by Andrew Jackson. By April of 1831 it was clear that Berrien was a friend of the Bank of the United States and opposed to its termination, and President Jackson requested his resignation. Collier's Encyclopedia, Volume 19, p. 30. P.F. Collier, Inc., New York City, 1993. This was the same Timothy Pickering who, as a Senator, helped form the text of the TONA in committee, and who voted for it. Roger B. Taney was appointed Attorney General by Andrew Jackson in 1831, to replace John MacPherson Berrien. General Jackson, by James Parton; a volume in the series Great Commanders, edited by James Grant Wilson. D. Appleton and Company, New York, 1897. See chapter XXI, "Terror Among The Office-Holders." "In 1850 there were in all the Southern States only 170,000 men owning more than five slaves each, and they owned 2,800,000 out of 3,300,000. These men by their system rendered labor degrading -- they have driven out their non-slaveholding neighbors by hundreds of thousands to find homes and self-respect in the free air of the West." So writes Edward Atkinson in "Is Cotton Our King?" Published in The Continental Monthly, Volume I, No. 3, March, 1862. Pages 247-256. He touches on the importance of Texas, in the economics of cotton, and in demonstrating that the slavery faction was a monopoly: "Texas, which is now more than half cultivated by free labor ... is simply capable of producing six times as much cotton as is now raised in the entire South." For a comprehensive review of the ways that Nicholas Biddle manipulated both House and Senate committees charged with oversight on the Bank of the United States, see Marquis James' Andrew Jackson: Portrait of a President; Chapter XI "A Greek Temple In Chestnut Street." For example, Biddle approved settlement of a debt owed the bank by Asbury Dickins, the Chief Clerk of the Treasury, for fifty cents on the dollar. Andrew Jackson's Postmaster General, William T. Barry, received a generous extension on his loan at the Bank. Published by The Bobbs-Merrill Company. New York, 1937. The Continental Monthly, Volume I, No. 1, Published by James R. Gilmore, 110 Tremont Street, Boston. January, 1862. "The Slave Trade in New York" -- Pages 86-90. The author was probably former U.S. Senator Daniel S. Dickinson, a Democrat from Binghamton with expert knowledge of the operations of the Port of New York, but is not attributed. The Biographical Directory (p. 1824), records that Isaac Toucey was the prosecuting attorney of Hartford County from 1822 to 1835, a two-term Congressman, and Attorney General under President James K. Polk. Since there is no way he could not have known of the validity of the TONA, as it appeared in Connecticut's books of Statute Law, he must be counted as being part of the Buchanan cabal. The Presidents of the United States 1789-1914, edited by James Grant Wilson. Volume II, "James Buchanan." by George Ticknor Curtis. New York, Charles Scribner's Sons, 1914. P. 227. From "The Knights of the Golden Circle," published in The Continental Monthly, (Volume I, No. 5, May, 1862), we learn that the precursor organization to the Klan was a secret society open only to citizens born in slave states, or sympathetic to the cause of the slave-holding class and having the character of a Southern man. "The 'object' of it all is to form a council for the Knights of the Golden Circle, and organize a goverment for Mexico." Its founder was Dr. George Bickley, of Cincinnati, Ohio. The unattributed author of this essay calls him "a miserable quack and confidence man," yet notes that Bickley "has been a useful tool to shrewder men in managing for them this precious Order." The Knights were not, in a strict sense, a society of military honours but rather similar to the Carbonari. Their goal was the creation of a slave-holding empire on the "Golden Circle" from Florida to the southern tip of Mexico. P. 575, The Continental Monthly, J.R. Gilmore, 532 Broadway, New York and 110 Tremont Street, Boston. Judah P. Benjamin: The Jewish Confederate. Eli N. Evans, The Free Press -- MacMillan, Inc. -- New York City, 1988. P. 237. After the Civil War, Benjamin fled to Great Britain, where he was admitted to the Bar and often argued cases before the House of Lords. He advanced rapidly, because of his knowledge of both Spanish law and language, by taking cases involving international or maritime issues. He was born on the island of St. Croix, a British possession, in 1811 and died in 1884. "There is ample and positive proof that the order of Knights of the Golden Circle is thoroughly organized in every Northern State as auxiliary to the Southern rebellion. It has acted here, as is well known ... under different names, such as the Peace Society, the Union Party, the Democratic Society, [or] Democratic Club." From The Continental Monthly, Volume I, No. 5. "The Knights of the Golden Circle,", p. 576, etc. Biographical Directory, p. 787. Thomas Corwin was elected to the State Legislature of Ohio in 1822, 1823 and '29. He was also prosecuting attorney of Warren County for ten years, after being admitted to the bar in 1817, with his practice established at Lebanon. He then served nine years in the House of Representatives, resigned, and was elected Governor of Ohio in 1840. Unsuccessful as a candidate for re-election, he was an Elector for Clay & Freylinghausen on the Whig ticket of 1844, and was sent to the U.S. Senate in 1845 (Ohio published the TONA in 1823 and 1848). After five years he was nominated to become the Secretary of the Treasury by President Millard Fillmore, and served nearly three years. Returned to the House of Representatives for two additional terms, beginning in March of 1859. Lebanon, in Warren County, is only 28 miles northeast of Cincinnati, Ohio, home of Dr. George Bickley and headquarters of the first "Castle" for the Knights of the Golden Circle. It is difficult to imagine that Corwin did not know of Bickley and his pro-slavery secret society. Curiously enough, Thomas Corwin was sent by Abraham Lincoln to be Ambassador to Mexico and served from March of 1861 until September of 1864. He died in Washington, D.C., in December of 1865. The Congressional Globe, Second Session of the Thirty-sixth Congress, p. 1260-1261. To wit: "Article 7, Sec. 1. The elective franchise and the right to hold office, whether Federal, State, territorial or municipal, shall not be exercised by persons who are, in whole or in part, of the African race." It was defeated on February 27th, amidst tremendous tumult and disorder in the House, by a vote of 80 for, 113 against, with the abolitionist Republicans standing rock solid against it. Corwin was chairman of the Special Committee of 33, charged by the House with finding a means to entice the secessionist States into returning: on its first reading, the proposed Amendment did not begin with "Article Thirteen," although other versions did. However, its text was a definite surprise to some members of the House, including Orris S. Ferry, of Connecticut. "I have never heard of this amendment before, and I am a member of the Committee," said Ferry, an 1844 graduate of Yale College. Congressional Globe, Second Session, Thirty-sixth Congress. Agents-provocateur - A person hired to join an organization to incite its members to actions which will make them or their organization liable to penalty. Bona Fide - In good faith, without dishonesty, fraud or deceit, authentic. Bribery - 1. Anything, especially money, given or promised to induce a person to do something illegal or wrong; 2. Anything given or promised to induce a person to do something against his wishes. Also (vt) 2. To get or influence by bribing. Disparate - Essentially not alike; distinct or different in kind. Espionage - The act of spying; the practice of spying or using spies to obtain information; the use of spies by a government to learn the secrets of another; from the Middle French espionner, to spy, derived from Old Italian, spione. Gentry - High rank, people of high social standing, people of a particular class or group. Graft - a) The act of taking advantage of one's position to gain money, property, etc. dishonestly, as in politics; b) anything acquired by such illegal methods, as an illicit profit from government business. Homage - an avowal of allegiance by a vassal to his lord; an act done or thing given to show the relationship between lord and vassal (a subordinate, subject, servant, slave, etc). Honour - high rank or distinction of superiority to be treated with deference or obeisance. Impress - to draft or force men into public service, esp. into the navy; to levy, seize or requisition for public use. Influence-peddling - the offering of the ability of a person or group to produce results indirectly by means of the power based on wealth, high position, authority, etc..
Nabob - a very rich or important man; derived from the Urdu nawwab, a plural form of the Arabic word for governor, na'ib; entered the language around 1612; originally referred to a provincial governor of the Mogul empire in India. Nobility - [Artificial] high station of rank or privilege in society, especially when accompanied by a title. "These had anciently duties annexed to their respective honors. They are created either by writ, i.e., by royal summons to attend the house of peers, or by letters patent, i.e., by royal grant of any dignity and degree of peerage; and they enjoy many privileges, exclusive of their senatorial capacity." 1 Blackstone's Commentaries 396. Obeisance - The attitude of homage, deference. Office - A position of authority, or trust. Partisan - Taking the part or strongly supporting one side or party; often, specifically, an unreasoning, emotional adherence. Present - Something presented, a gift. Rump - A legislature, etc., having only a remnant of its former membership, as because of expulsions, and hence regarded as unrepresentative and without authority. Title - an appellation given to a person as a sign of privilege. An [artificial] claim of right. Xenophobia - Fear or hatred of foreigners or strangers or of anything foreign or strange.